Dillon may be a size smaller than most, but with its access to the Dillon Reservoir, the historical and cultural museums, and the outlet stores, it punches well above its weight. 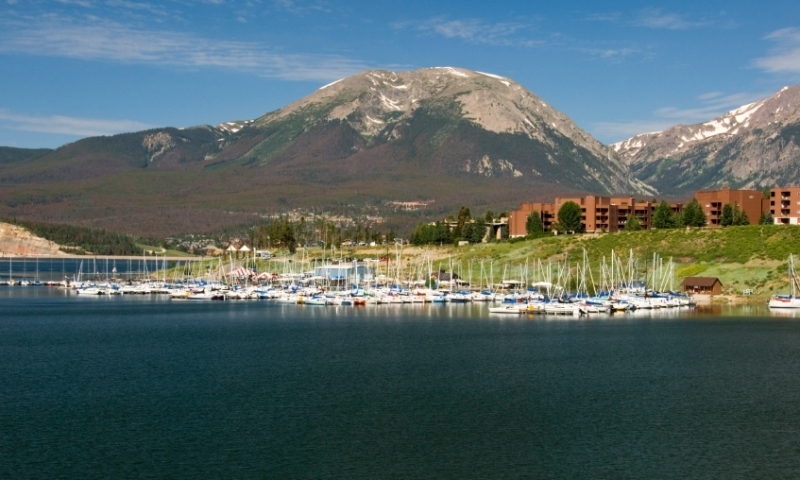 Although it's easy to pass by and difficult to see from the highway, Dillon is a quaint community as well as a major access point for Lake Dillon, even hosting the yacht club at the marina. The town has a unique history, having been originally placed at the juncture of three rivers, a place which now is deep in Lake Dillon. Many buildings were moved to their current location during this period of the early 1960's. Dillon is Silverthorne's twin town across the highway, about 70 miles west of Denver and 30 miles east of Vail. The Silverthorne Factory Outlets may carry its neighbor's name, but Dillon is equally close to the stores. Over 80 brand name stores, regularly featuring discounts and sales, are 1.5 miles from the town of Dillon, Colorado. Also, some of the best dining in the county is available in Dillon, CO. Because of the combination of locals who live and work in the area and visitors who demand high quality and selection, the restaurants have a stable clientele that lets them create inspiring menus, while keeping reasonable prices. The Dillon Yacht Club is the highest club in North America at 9,000 ft. In coordination with the marina, the club holds lessons, rents sailboats, and even has a number of regattas that draw in competitors from miles away! Fishing is another popular activity on the Dillon Reservoir, particularly trolling and bait fishing. Fly fishing is found on the Blue River as it passes through town. As if to prove that Dillon is a town for the locals, it has the only bowling lanes in the county, so come on out to roll some strikes! Lake Dillon is an attraction unto itself. Rent a boat to head out on the water to get a view of the surrounding mountains. It's incredible, so don't forget take pictures! There are a couple of different historical sites in town, including the Schoolhouse Museum and Lula Myer's Ranch. These detail the story of the town as it grew up, gained popularity, and then was forced to move for the construction of the Dillon Reservoir in 1963. Dillon is located just south of I-70 exit 205. If coming from Denver, head west on I-70 for a little over an hour. If coming from Vail, head east on I-70 for about 30 minutes. In order to get to Dillon, CO travelers have to pass the Silverthorne Factory Outlets, which is enough of reason to stop, according to many. The official site for the Town of Dillon, Colorado. Official site for the Town of Silverthorne, Colorado.